This newsletter is a vehicle for members of the Domestic Violence at Work Network to learn about each others' work and new developments in the area of addressing workplace domestic violence. Send us information about what you are doing. We will profile more members and their work in future issues. Please feel free to share this newsletter with others. (b) to convene a tripartite meeting of experts to provide guidance on which basis the Governing Body will consider, at its 328th Session (November 2016), the preparations for the first discussion of possible instruments by the Conference. How will the tripartite meeting of experts (TME) operate? The TME is scheduled for 3-6 October 2016 in Geneva. It has before it report(s) prepared by the secretariat. The Governing Body approved budget resources (economy travel/accommodation/DSA) for 24 participants: 8 governments x 8 union representatives x 8 employer representatives =24. Advisers can accompany the participants. The ILO workers’ & employers’ secretariats organise who will be the union and employer participants, but expressions of interest can be made, so, for example, the Australian ACTU indicated to the ILO and the ITUC that they wish to participate. Another determinant is geographical spread. The country representatives have been chosen: Argentina, Belgium, Canada, India, Philippines, Rwanda, South Africa and Sweden are on the first list. In the event that one of those countries is unable to attend a replacement will be selected from the reserve list: Australia, Bosnia and Herzegovina, Brazil, Italy, Japan, Mauritius, Niger and United States. It is clearly very important that our Network has members at the TME able to provide an informed contribution on the issue of domestic violence at work. The budget for this TME is for 4 days, and will follow a Timetable prepared by the secretariat for fine-tuning by the groups at the opening. This concludes with a plenary for the adoption of a ‘Report of the Proceedings’, usually accompanied by a set of “Agreed Conclusions”. The TME sets its own procedural rules, elects a Chairperson and Worker & Employer Spokespersons for their respective groups. The Governing Body decision (above) has given the scope of the TME’s mandate. Another traditional role of such expert meetings is to iron out or clarify sticking points before discussing a full standard—setting process which will open late May 2018 in the form of a special ILC Committee. The “Agreed Conclusions” are enormously helpful in classifying what is non-controversial/what remains a hurdle. Possible problem areas for the discussion on linking domestic violence and violence against women and men at work could include a “set position” reluctance to accept that “private personal areas” affect work, evidential matters (where it is not clear or disputed that domestic violence is a workplace issue), a need for more research, variations of the definitions of domestic violence, the adequacy of existing domestic violence protections in UN instruments such as the UN 1993 Declaration or CSW Agreed Conclusions, and, as the Australian debate has illustrated, the compliance problem for small business. As noted above, ILO prepares a background paper(s) for the TME. Our Network can already play an important role providing information to the Office. If your country has been chosen as a representative, please contact your government and offer to help them prepare by providing information and evidence about the impacts of domestic violence on workers and the workplace. Chidi King, Head of the Equality Department at the International Trade Union Confederation, talks about the importance of the ILO convention on violence against women and men in the world of work at the ITF Women’s Forum. 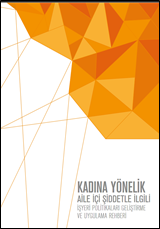 "Business Against Domestic Violence Policy Development and Implementation Guide"
A new step was taken in the Business Against Domestic Violence project implemented by the Sabancı University Corporate Governance Forum. The Sabancı University Corporate Governance Forum prepared a “Business Against Domestic Violence Policy Development and Implementation Guide” for the project. The guide developed in partnership with TÜSİAD and the support of the UN Population Fund and Sabancı Foundation, and revealed on Tuesday, December 15, 2015 at the Istanbul Chamber of Industry Assembly Hall. The foreword to the guide was written by TÜSİAD Chairperson Cansen Başaran Symes and UNFPA Turkey Representative and Armenia, Azerbaijan and Georgia Regional Director Karl Kulessa. The guide focuses on the violence suffered by women in personal relationships, either currently or in the past, and its impact on work and the workplace. The guide includes details on how to create a corporate policy to combat violence against women, and provides sample policies for adoption or adaptation by companies. The best practices section summarizes policies and efforts of companies in Turkey and abroad regarding their work in violence against women. 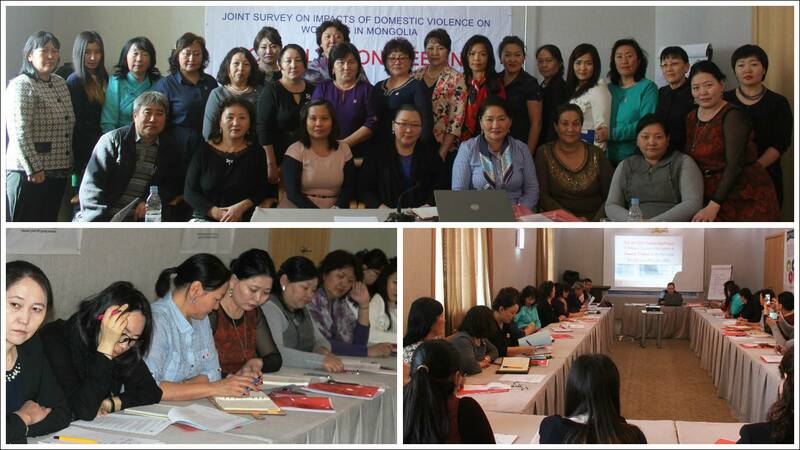 The guide includes steps, tools and methods, and successful implementation examples from companies that have adopted gender equality as a workplace principle, which will provide input to policies and procedures which will ensure that employees and the workplace is affected by domestic violence against women at a minimal level. The guide also refers to projects which seek to contribute to the social struggle against violence and are implemented by companies as part of their social responsibility efforts. Make It Our Business Interview with The Conference Board of Canada’s Charles Boyer, Research Associate II, Workplace Health, Wellness and Safety Research Group. The Conference Board of Canada is an independent, evidence based Not For Profit that does not lobby for specific interests and is funded through service fees charged to the private and public sectors. They are experts in: conducting, publishing and disseminating research; forecasting and economic analysis; organizational capacity building and performance as well as public policy, to name a few areas of expertise. Does Your Workplace Have a Re-active or Pro-active Approach to Domestic Violence? One of the most impactful activities The Conference Board of Canada conducted was a survey of its members and a report on the findings. 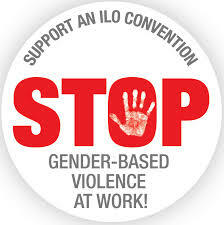 Why is The Conference Board of Canada working to raise awareness of Domestic Violence in the workplace with members? Our work in this area started around the same time Western University's Pan Canadian survey, which focused on employee experiences with domestic violence, was wrapping up. Along with the Western University study, there was a lot of media coverage around high profile athletes and domestic violence. Members of Executive Networks within our Leadership and Human Resources Research group began asking questions about what resources were available to help employers address domestic violence. Specifically, one of our Executive Networks, the Council on Workplace Health and Wellness, which I manage, had a meeting to discuss domestic violence as part of a larger conversation on creating a respectful workplace. Through engaging with our members we realized there was a gap that we could help fill by surveying our members on what current policies and procedures they implement in cases of domestic violence. What was the most surprising information you have learned from your survey? One key finding was how receptive organizations were to the notion of the need to support individuals who are experiencing or have experienced domestic violence. For instance, 96% of employers in our survey believe domestic violence impacts the performance and productivity of employees. However, while most organizations recognize the need to support victims, few offer training and education on how managers and co-workers should react when they discover a co-worker experiencing domestic violence. Previous research has shown that among employees who disclose domestic violence to someone at work most will choose to disclose to a manager or co-worker. Our results show that while most employers with a domestic violence policy have roles and responsibilities for both managers and co-workers, few employers actually offer training and education for them. What does The Conference Board of Canada hope members will do with the information that has been provided? We hope that this information will help our members and other Canadian employers to better address domestic violence in the workplace. The report contains survey data as well as practical tools employers can use to develop a domestic violence policy. Has The Conference Board of Canada advocated for and changes in government level policies regarding domestic violence at work, or are there plans to do so in the future? No we have not advocated for government changes, but laws like Bill 168 in Ontario are steps in the right direction to give employers a roadmap to better understand what their responsibilities are in situations involving domestic violence. Aware and supportive employers may help employees feel more comfortable about coming forward with issues of domestic violence. Have any members shared a story to demonstrate your promotion of resources and training has made a difference? We have received positive comments from experts in the field, as well as employers, about our work in this area. Already, the report has been downloaded 191 times from our website. The report is a great step towards better understanding what employers have in place to support employees experiencing domestic violence. As we outlined in the report, while many employers understand that domestic violence impacts the performance and productivity of employees, there is still a lack training and education in workplaces on how to best address these situations. Uniglobal representing 20 million workers from over 900 trade unions in the skills and services sectors in planning a survey for its membership. The survey will go out to over 40 countries and be available in five languages. Denise McGuire, President of UNI Equal Opportunities and Veronica Fernandez Mendez, Head of the Equal Opportunities Department have been working closely with researchers from Western University to prepare the survey. Baker Khundakji, Deputy Regional Secretary of the International Transport Workers, Arab World and Jodi Evans, ITF Women Transport Workers Assistant Coordinator have had the survey translated into Arabic and engaged in a process of consulting with local women’s organizations in Egypt to customize it for that context. They are considering also doing a survey in Tunisia with the assistance of Kalthoum Barkallah. Each survey, which includes a set of core questions, requires translation and customization to ensure that it makes sense in the local context of those who will respond to it. The surveys are approved by the Western University Research Ethics Board to safeguard against doing harm to potential respondents. Adapting the surveys and shepherding them through the ethics approval process is a labour of love for those involved. We have seen concrete change come about as a result of the evidence collected by the surveys in Australia and Canada, where collective agreements and new legislation are providing new protections for workers experiencing domestic violence. We are committed to expanding this work and to bringing greater safety and security to workers around the world who are experiencing domestic violence. To see reports from existing surveys, visit the DV@Work Net website. The intersection of experiencing interpersonal violence and disability in the workplace is complex. The already vulnerable position of women with disability cannot be overstated as their unemployment rate is extremely high – between 52% to 75%. Women with disabilities are more at risk of abuse, and the abuse may compound the impact on their disability. In addition, disability can be caused or exacerbated by domestic violence. Abuse can be manifested differently in this context by actions including denying access to medications, refusing to take women to doctors’ appointments, or refusing to provide personal care such as bathing and other living assistance or psychological abuse of individuals with cognitive or mental disabilities. This points to the need to develop a strategic plan to provide information and support regarding the intersections between domestic violence and disability outcomes. This strategic plan should address barriers to disclosing domestic violence at the workplace such as stigmatization, while ensuring victims that their disclosure will not result in loss of employment. Making this information available and accessible and ensuring it is widely shared will help to maximize workplace productivity and safety. In terms of policies and legal proceedings, there should be a clear understanding of the types of disabilities most frequently caused by abuse. Finally, a refined and inclusive strategic plan acknowledges the need for ongoing trainings for all workers regarding domestic violence, with a focus on how to respond to victims/survivors with disabilities. A new Manitoba law offers victims of domestic violence (DV) paid and unpaid leave from work, guaranteeing job security if they have to take time off as they seek safety away from abusers. This law will give victims five paid days, five unpaid days and an additional 17 week unpaid period. It is the first law of its kind in Canada to offer entitlement to a paid leave of absence under Employment Standard legislation. A Private Members Bill has passed second reading in Ontario which would offer 10 days paid leave, unpaid leave as well as flexible work accommodation for survivors of both domestic violence and sexual violence. Several state laws across the USA already provide varying access to paid or unpaid leave for survivors. For example, while Massachusetts’ new law offers up to 15 days unpaid leave after exhausting all other leaves, California’s law allows survivors to use paid sick leave for their health condition affected by violence. These laws are premised on the notion that people should not be penalized at work when they are victimized at home. The leaves give workers much needed time for to rebuild their lives and recover from the impacts of living in an abusive relationship. Both employers and employees benefit from increased safety and productivity. We are seeing a cultural shift away from blaming the victims/survivors for low productivity and safety concerns to providing support that will enable them to fulfil their full potential. It is also important to recognize the significant costs and safety concerns that result from employing perpetrators of domestic violence. Other provisions such as flexible work arrangements, safety planning and no reprisals for disclosing domestic violence are important entitlements to accompany paid leave as abusers often access and harass victims/survivors in the workplace. Rather than seeing domestic violence as a private matter, we are learning to recognize it as an urgent public policy issue. The first ever ITF action forum on violence against women working in public transport has been called groundbreaking by participants. 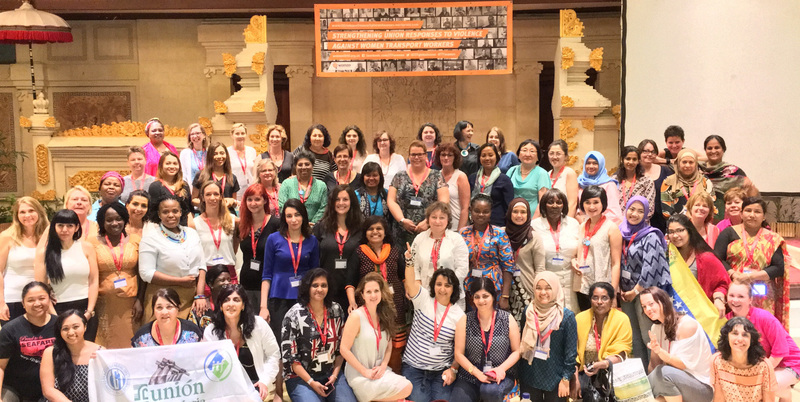 75 women from ITF road, rail, civil aviation and urban transport unions, and members of the ITF women’s committee, met in Bali May 25 – 27, 2016 to build on or kick start their work around tackling violence women transport workers face in their daily lives. Of particular focus were the potential expansion of a women’s advocacy programme as championed by Canadian member union Unifor, and the part unions can play in their home countries in campaigning and lobbying for an ILO (International Labour Organisation) convention covering violence against women at work. 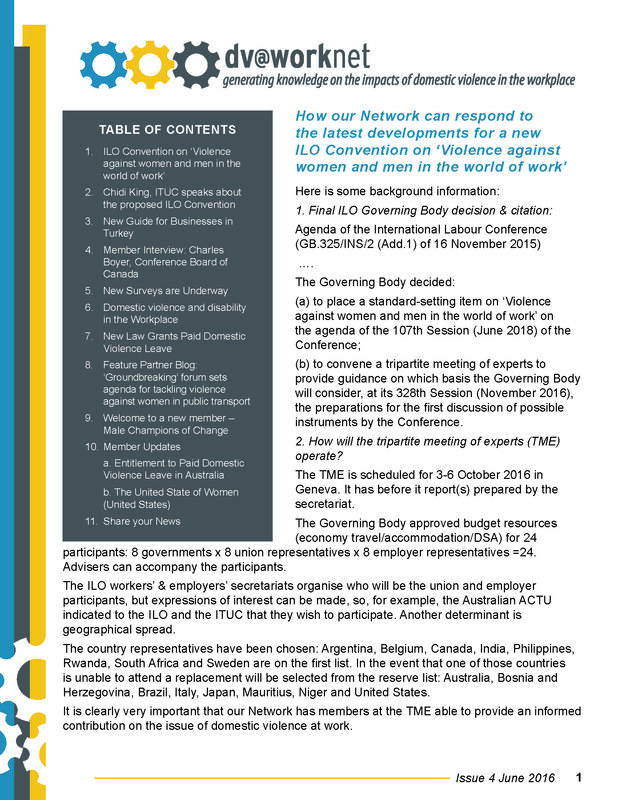 The convention – ‘violence against women and men in the world of work’ - is due for discussion at an ILO experts meeting in October with a view to potentially coming being adopted in 2019. 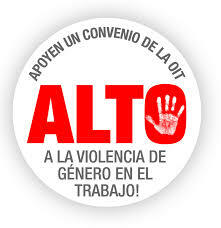 It would be the first official international treaty that specifically focuses on violence at work. Interviews, pictures, reports and comments were captured on the ITF violence free workplaces for women blog throughout the event. Access it here. Go to the ITF women’s pages for more on the work of the ITF and its unions around supporting women transport workers. DVatWork Net welcomes our newest member – Male Champions of Change. The Male Champions of Change strategy is about male leaders stepping up beside women to advocate for and act to advance gender equality. The strategy works with influential leaders to redefine men’s role in taking action on gender inequality. Through the Male Champions of Change strategy peer groups of influential male leaders work together to understand gender equality issues and lead tangible action to accelerate progress. They step up beside women and work collectively to disrupt the status quo. To learn more about the Male Champions of Change visit their website. The Australian Council of Trade Unions (ACTU) has the latest data from the Department of Employment about domestic violence clauses in enterprise agreements. March 2016 marked another milestone - 1234 agreements covering 1,004,720 workers. But the evidence shows that employers are continuing to negotiate such variability in conditions that collective bargaining has not delivered the standardised safety net required to provide consistent safety and support. For this reason the ACTU is pursuing its case for a set of minimum leave rights (10 days) in national modern awards (covering a minimum of 6 million workers). With an election in July of this year, if elected the Labour Party has promised to enshrine domestic violence leave in the National Employment Standards and to ensure the standards are well implemented. The current Minister of Employment and of Women has publicly stated that she thinks domestic violence leave may be a disincentive for the employment of women. Similar arguments were put forth to oppose maternity leave when it was first proposed. Here is the list of presenters and details for the United State of Women – I am so honored to be among them and to talk about the work the Corporate Alliance to End Partner Violence (CAEPV) does with the corporate world to address violence against women as part of the Solutions Seminar “Changing the Culture to End Violence Against Women.” I will also be thrilled to discuss the work going on via our partners here! Thank you all for all you do to end violence against women – you are changing the future! 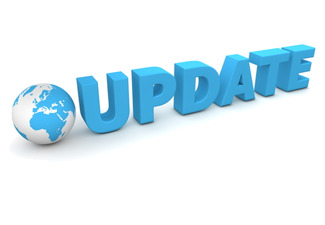 Do you have news relating to domestic violence and the workplace? If so, share it with us! Send us news about research, local events and issues, trends and breakthroughs. We also want to hear ideas for upcoming newsletters. Share your interests and concerns. 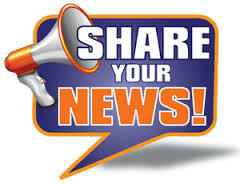 Send us news links, website links, online videos, and photos. And please feel free to share this newsletter with anyone you think might be interested. While DV @ Work is developing its website, you can send information or inquiries to bmacquar@uwo.ca or communicate with us via Facebook..